Reports vary on how many people died in the attack. According to Reuters, at least 16 have been killed and 27 injured. At the same time, AFP has cited Borno State police spokesman Gideon Jubrin, who said there were 20 deaths, including the suicide bomber, and another 18 wounded. 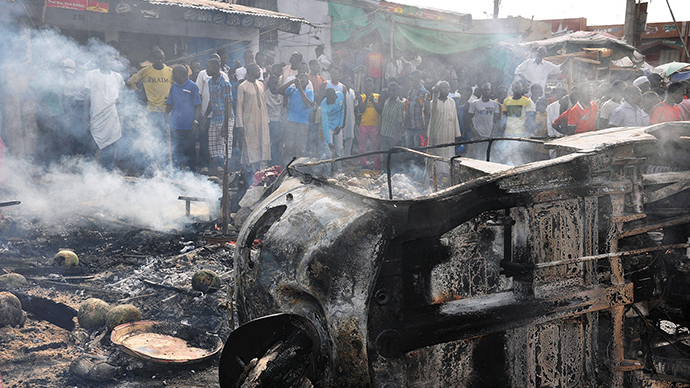 The explosion happened at a Market in Maiduguri, the capital of Borno state at about 12:15 pm local time (11:15 GMT) when the market was full of customers and salesmen. Witnesses say the bomb was remotely controlled. The girl was stopped at the entrance as the metal detector showed she had something strapped to her body. "The explosive devices were wrapped around her body and the girl looked no more than 10 years old," a police source told Reuters. The explosive devise detonated while the girl was being searched. “I doubt much if she actually knew what was strapped to her body," Civilian vigilante Ashiru Mustapha has been cited by AFP as saying. "But sadly, the explosion went off before she was isolated,” he added. “I am pretty sure the bomb was remotely controlled,” one of the witnesses has also told the news agency. Over 10,000 people died in clashes with the militants and in terrorist attacks in Nigeria in 2014. The recent attack in the town of Baga could be the deadliest attack by Boko Haram since the extremist group surfaced in 2009 with some reports putting the number of fatalities as high as 2,000.